Osman I (1258-1326) - In less than a century, the Mongols had conquered just about every Islamic kingdom that existed. But that did not mean that Islam disappeared. In fact, many Mongols themselves became Muslims. What it did mean is that, after the break-up of the Mongol Empire, the door opened for a new Islamic kingdom to take root. In Asia Minor, there was a Turk by the name of Osman who took advantage of the vacuum that was created. He was born in 1258, the very same year that Baghdad fell to the Hulagu Khan. 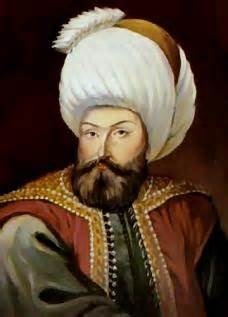 His father, Ertuğrul, had been a leader of the Oghuz Turks, a rival clan and subjects of the Seljuks. But as the Seljuks were fragmented by the Mongols, the Kayi Tribe (a branch of the Orghuz) broke away and became semi-autonomous. Ertuğrul fled west from central Asia, along with a group of followers, to escape the Mongol onslaught and ended up in Asia Minor. The location turned out to be fortuitous as it was not under the firm control of any powerful empire. When Ertuğrul died in 1281, Osman became leader of the Kayi Tribe and began a campaign of expansion, mostly at the expense of the rapidly declining Byzantine Empire. He benefited from an influx of refugees who were themselves fleeing from the Mongols. Osman managed to mold them into a formidable army. However, his relatively small kingdom was still more or less a vassal state of the Sultanate of Rûm, a more powerful Seljuk Empire to the south. Turkish historians mark the beginning of the Ottoman Empire with a dream Osman supposedly had in which he foresaw the rise of a powerful kingdom. He was staying in the shrine of a holy man, named Sheik Edebali, and in his dream he saw the moon rise from the sheik's breast and settle on his own. Then from his navel a tree sprang whose branches spread out and covered the whole world. In the morning, he asked Sheik Edebali what the dream meant. The sheik answered him, "Hail Osman! God has bestowed sovereignty upon you and your descendants. My daughter will be your wife and the whole world will be under the protection of your children." Osman took this as a great omen and declared total independence from the Sultanate of Rûm in 1299. Such a move would normally lead to war, but Sultan Alaeddin Keykubat of Rûm responded by sending Osman "a horsetail, standard and drum", thereby recognizing Osman's new kingdom. It would become the Ottoman Empire, one of the most powerful in the world in the late Middle Ages, before entering decline in the 18th century and finally falling in 1922.